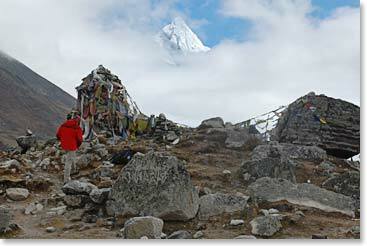 I am calling from 15,900ft/4,850m above sea level from the terminal moraine of the Khumbu glacier. The team is doing great and we are really getting into the high mountains now. It is a beautiful day and we are moving slowly and purposefully. Now we are approaching the highest elevations we will reach on the trip and I have to say that the team is doing well. Last night at Pheriche, the second night at the lodge, we had a wonderful meal. Phuri cooked fresh roasted chicken, roasted potatoes, fresh grilled vegetables and he topped it off with a real Berg Adventures treat, sushi. And of course, since we had sushi, we served a couple tubes of some really hot wasabi sauce. For dessert the staff brought out a cheese cake and it topped off a perfect meal. Today I mentioned to everyone that they should not be surprised if their appetites start to decrease after this as we climb higher. In fact, we had a great lunch, ramen soup, cheese sandwiches and more fresh vegetables, but we did eat less. After lunch we climbed up a large hill and now I am calling you from a spot that many of you may have heard about or may know from previous dispatches. It is a moving, beautiful and profound place where Sherpas long ago began to build memorials for their family members who have been lost on Everest. Our trekking groups always stop here, and in the dozens of times that I have stopped here, as I recall, it has always been a bit cloudy. It is a spiritual place and a moving place, as I mentioned. It always gives us pause. Now we have arrived at Lobuche and we are at 15,800ft/4,815m and that feels good right now. There is a light snow on the ground here. As we walked along the lateral moraine from the memorials to Lobuche, we couldn’t see the top of Everest, but could see the steep slopes rising up from Base Camp. It is really exciting to be here in this terrain. 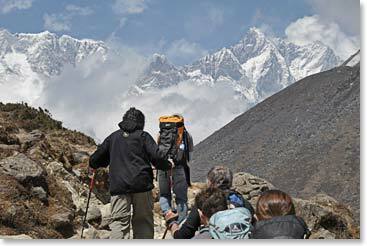 Now it is good to be warm and welcomed at our lodge along the Khumbu glacier. Tomorrow we will be climbing higher and I will report to you from Gorak Shep and perhaps even the summit of Kala Patar.